With Canada co-hosting the 2026 World Cup alongside Mexico and the U.S., an automatic berth is likely -- if yet unconfirmed. Expansion to a 48-team field will also help Canada's chances in 2026 and beyond. With Canada co-hosting the 2026 World Cup alongside Mexico and the U.S., an automatic berth is likely — if yet unconfirmed. Expansion to a 48-team field will also help Canada's chances in 2026 and beyond. But the Canadian Soccer Association wants to get in via the front door in future tournaments, including 2022. And there is new blood in the program, currently under renovation by men's coach John Herdman, who switched over from the women's side in January. Here is Canada Soccer's blueprint to get there, as detailed by Herdman, technical director Jason deVos and general secretary Peter Montopoli. 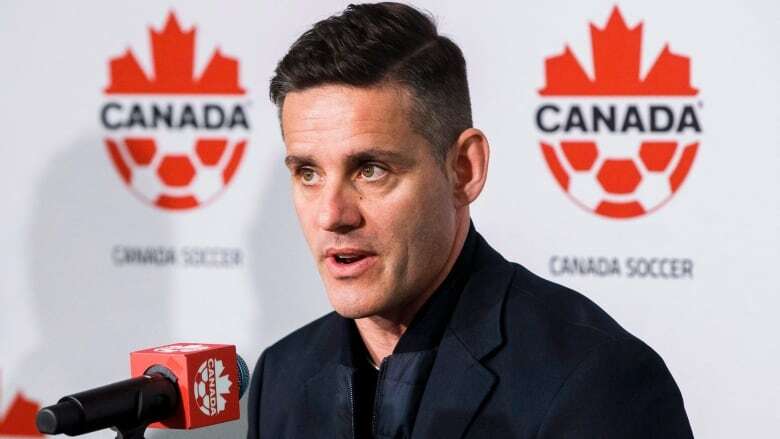 Herdman says while Canada may never be able to compete with the football culture and numbers of Mexico or the dollars available in the U.S., "there are things in Canada we genuinely can be best at." That includes areas like sports science and mental preparation, with Herdman listing off names like Penny Werthner, Ceri Evans, Ian Renshaw, Nicola Hodges. "We have got the resources, we've got the people," said Herdman, known for leaving no stone unturned. "And we've got a clear template based on the success of the women's national team, who were able to utilize a lot of these resources and a lot of the learnings have been left behind." While Canada is huge geographically, Herdman says the number of football leaders is small. That means the number of people to be influenced — or convinced — to join the national vision is smaller than a lot of other countries with a string of leagues and regulatory bodies. While getting everyone "looking in one direction" may be harder than it sounds, Herdman believes hosting the 2026 World Cup will help provide the necessary impetus. Herdman, who had great success identifying young women's talent, envisions one clear pathway helping develop players, integrate new migrants into the soccer system or track Canadians who have moved abroad. The Canadian Premier League, the new men's pro league set to kick off next spring, offers another piece of the pathway. Herdman says Canada Soccer is looking to "streamline our systems behind the scenes" to avoid duplication or mixed messages. That includes everything from how best to marshall a team at a tournament to what Canada expects from each position on the pitch. "The likes of myself and Mauro are willing not to just sit in the ivory tower and look down on the game and just deal with the 23 [senior] players," says Herdman. "We're here to system-build, we're here to lay that foundation for 2026. We're here to influence what's happening at the provincial level." Herdman's support crew will be more of the same, he says. His goal is to train and develop as many coaches at possible at the grassroots level who understand that player development is not linear — that the best eight-year-old isn't necessarily going to be the best 18-year-old. "It's up, down, sideways and it happens in spurts and fits," says deVos. Imposing an adult results-based framework on kids doesn't work, he argues. His goal is to give young players "access to good environments," changing structures and rules along the way if needed. "We should create environments in which they can fall in love with the game, play with their friends on one day and play with similar-ability players on another day," he adds. "This notion that anyone can predict where a child is going to be in five, 10, 15 years is laughable. Nobody can do that. So why are we de-selecting kids from programs based on competency as young as the age of seven ... These are the lessons that have been taught to us by the other nations who are punching above their weight, who are succeeding." "A 10-year-old is not a miniature 20-year-old," says deVos. "We've reached out to them and said 'Can you help us?"' he says. "Hot-housing" the best 12-year-olds in the country does not translate into a crop of top pros, he argues. All three says Canada's success in the women's ranks is a resource that can only help the men's game. They believe sharing knowledge and best practices can be a benefit. Herdman brought women's coach Kenneth Heiner-Moller into the Canada Soccer fold, so the ties are already strong. Montopoli believes Canada is already a leader in the field in developing a symbiotic relationship between the two national teams. While hockey may be king in Canada, there are more registered soccer than hockey players. And Montopoli notes that Canadians ranked 12th among all countries in terms of purchasing tickets for the World Cup in Russia. "I feel the sport is incredibly relevant," says Montopoli. "We might be one of the few countries that has that relevancy of men's and women's football," he adds.